At his practice, patients throughout Chesterfield and the St. Louis area can undergo a variety of wrinkle reducing skin treatments including Botox® and cosmetic fillers. At MidAmerica Skin Health & Vitality Center, Dr. Muccini, uses Botox® and fillers to assist patients with improving the appearance of crow’s feet, fine lines, aging hands, and volume loss to help them feel their best. What are Facial (and Hand) Fillers? Fillers are cosmetic tools like calcium hydroxylapatite, hyaluronic acid, and collagen which help to plump lips, restore skin, lessen the appearance of wrinkles, minimize scar depressions, and replace lost volume in soft tissues of the face and hands. Fillers can treat many cosmetic or aesthetic issues, but typically they are employed to treat facial fine lines and wrinkles or aging contours on the cheeks or other parts of the face as well as lost volume in aging faces or hands. Results may be long-lasting and are achieved through a number of small injections. These products literally “fill in” creases and lines and plump up facial or hand areas that have lost collagen, soft tissue volume, and/or fat. Radiesse®, Belotero®, Restylane® and Juvéderm® are among the filler products available at MidAmerica Skin Health and Vitality Center. Botox® is a cosmetic product created to reduce the appearance of fine lines and wrinkles, especially crow’s feet and frown lines located in between the eyebrows. Continual use of muscles, which make the face squint and frown, causes the skin to wrinkle and crease. Botox® injections temporarily block targeted muscle activity, which creates a noticeable change in the appearance of associated lines and wrinkles on the face. Botox® is injected beneath the skin’s surface in order to specifically target the facial muscles. Botox® is one of the only cosmetic treatments for fine lines and wrinkles, and it has been researched extensively by medical experts. More than 50 countries across the globe have approved it for cosmetic applications. 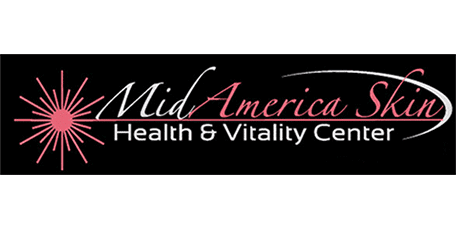 Both Botox® and an alternative botulinum product, Xeomin®, are available at MidAmerica Skin Health and Vitality Center. Customarily, Botox® or botulinum treatments take about 10 to 20 minutes. The specific time will change depending on the patient, the scope of the treatment, and how many imperfections are being addressed. If only a small number of issues or concerns are being managed, procedure duration will be much shorter. A set of small injections will deliver the products under the surface of the skin. The number of injections and amount dispensed will depend on the type of product being employed and the depth of the wrinkle or crease. For more extensive procedures, especially those involving fillers and the correction of volume loss, treatment may include time for a topical anesthetic to be applied and take effect, making the treatment take anywhere from 30 to 60 minutes, depending on the patient’s goals.